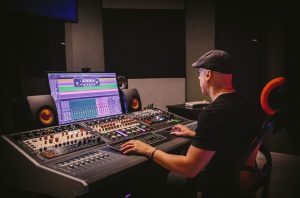 Powering Up the Digital Music Master(er) | Northmar, Inc.
Grammy-nominated Luca Pretolesi is a producer and mixing/mastering engineer who swears by the value of clean, consistent power provided by Torus Power to create award-winning dance and digital music. You could say that Luca Pretolesi, owner of Studio DMI (Study of Digital Music Innovation) in Las Vegas, is a master of EDM, or more accurately mixes and masters EDM. His list of collaborators alone is one that would make any self-respecting festival-goer step right into a shuffle: Diplo/Major Lazer, DVBBS, Borgeous, Gareth Emery, and David Guetta, to name a few. He has two Grammy nominations for his work on Snoop Lion’s “Reincarnated” album and Steve Aoki’s “Wonderland” album. Luca is currently Latin Grammy nominated for his mastering work on J Balvin’s and Willy William’s “Mi Gente”. More non-EDM artDigital musiist Luca has worked with include Jason Derulo, Flo Rida, Nicki Minaj, Snoop Dogg and 2 Chainz. Luca is on a never-ending quest to make digital music sound its very best and advance the art form of music production and science, which is evident in his rig. To wit, Studio DMI actually stands for (the) Study of Digital Music Innovation. Luca’s setup at Studio DMI incorporates a blend of analog and digital gear as well as plug-ins. His studio features GIK Acoustics 244 Bass Traps, Monster Bass Traps with Scatter Plates, QRD Diffusers, and Soffit Bass Traps to get the room right and accurate. The studio is setup on on a mastering console desk that is in the sweet spot of the room that’s anchored—literally and figuratively—by a Torus Power AVR isolation transformer. The Maselec MTC-1 mastering console sounds incredible, according to Luca, and is transparent with a lot of headroom. To this, sprinkle in a handful of vintage gear from the 80s and 90s, and you’ve got a recipe for some of the best dance music recordings ever. “I study digital music innovation and am deeply involved in Electronic Music to help audio producers make music better, including production work, mixing, and mastering,”Luca says. Sounds pretty straightforward, but much of his success lies in the secret sauce, which has largely to do with a solid power foundation. He uses a mixture of vintage gear from the ‘80s, new hardware, and plug-ins. But the chain is only as good as its weakest link, and power is at the heart of everything in the studio. Essentially, it’s the first link in the chain. “We want to minimize possible problems caused by power,” says Luca. “Especially for drums and transient response, it’s important to have very clean and linear power. ”Vegas, unfortunately, is not known for it’s clean power, so Luca enlisted the help of Pro Audio L.A. who introduced him to Torus Power. He soon learned why and later witnessed firsthand how a power isolation transformer would make every link in the music production chain have the best possible chance for greatness. Pro Audio LA recommended the Torus Power AVR (Automatic Voltage Regulation) specifically, which keeps hundreds of thousands of dollars worth of Studio DMI’s gear safe by enhancing protection against voltage sags, brownouts, and surges and delivering a steady, consistent stream of clean power. The Torus Power AVR not only provides a stable, clean, and safe power foundation for Studio DMI, it allows Luca and his team to get consistent, repeatable sound from recording to recording. “Part of my job is mixing, but it’s also to be able to do so with the same result, with the same sound, the same result, which I can only do by using exactly the same gear. “We do about two to three hundred songs a year, so we need to have a system that is recallable. Having stable power provided by Torus Power allows me to have the same transient response and the same (low) noise floor. When I recall a big mix, I don’t want to have a sound that changes and fluctuates several times. Again, a linear response from the power is very, very important,” says Luca. Being so deeply ensconced in the world of dance music, Luca uses mostly electronic sounds, where drums are being created from a sine or square wave, with very little use of acoustic sounds thrown into the mix. Using outboard gear is always a concern due to the noise floor, and going from a very old piece of gear from the 80s, to a new hardware, to a plugin allows new elements of noise to be introduced if the power is not conditioned. Current dance music is well known for being loud. When the bass finally drops, revelers can feel it in their bones and the crowd goes wild. On the mastering side, Luca is known for his ability to retain perceived dynamics but also create a sound that can really be cranked. He goes to –5 RMS (Root Mean Square, a measure of the power output of a speaker) to attain his sweet spot. The downside is by doing that, he brings compression and a lot of low-level information into the mix, especially on dance music. “In dance music, in breakdowns, on parts of music where we don’t have drums, we’re bringing in a lot of information, like reverb. Having a clean response allows me to do that, without worrying about noise floor. But if I use a lot of analog gear fed by bad power, it’s a big risk to bring noise into the mix,” Luca explains. In the end, there are many many elements that make music sound its best, and make people like Luca enjoy the process of making music. Luca Pretolesi of Studio DMI puts more thought into his equipment setup than many recording studios. Here, he takes a deep dive into the proper power setup for mixing, mastering, engineering, and producing using both digital and analog equipment. Pretolesi, who lays down some of the most popular EDM tracks of all time, details how Torus Power creates a low noise floor and solid power foundation to create ideal conditions to record amazing music. He covers the challenge with drums created from sine waves and little use of acoustic sound, and how Torus Power helps address those issues. Pretolesi also discusses the poor power conditions in Las Vegas, how different pieces of equipment can introduce noise if you don’t have the proper power, how he designed Studio DMI with power in mind, and how Torus Power helps him create a consistency in his sound across tracks and artists.